Stewards across all regions make a difference as leaders in their worksites. Whether you work in the community, in an acute care setting or in long-term care facilities, BCNU stewards help guide co-workers through work- and sometimes non-work-related concerns. They help members address problems and communicate crucial information about issues concerning their worksite and their profession. 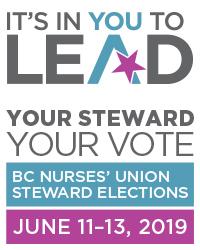 BCNU stewards also convey the ideals of BCNU and articulate the vision of improving the working life, well-being and economic status of members while being an advocate for public health care. In doing so, stewards inspire and mobilize members at their worksite. They're available to meet with members and develop a deeper understanding of the issues and concerns they face. They're able to assist members through the grievance process in the event of a dispute with the employer or support a member as they return to work after illness or injury. They're available and ready to lend a hand. As a steward, you will be able to work proactively with management and advocate for BCNU members. You will gain knowledge and develop skills to help you use BCNU’s problem-solving tools (grievances, PR process, JOHS committees, and union-management meetings) and resolve workplace concerns. You will feel the satisfaction of doing important leadership work that directly benefits you and your colleagues. As a steward, you will receive a wide variety of training that prepares you for the work you do. This high-quality education, reinforced by the leadership experience you will gain, will increase your competence and confidence in a number of areas that go well beyond your steward work – from effective advocacy and presentation skills to the ability to handle conflict and communication well. These educational opportunities are accompanied by multiple opportunities each year to gather with other stewards from across your region and the province to share ideas, support one another’s efforts and build strong relationships that often last a lifetime. Stewards are asked to commit to a three-year term. Over the first year you will learn the basics of the steward’s role. During the second year you may discover a passion and choose to specialize in a particular area of steward practice, growing your skills and knowledge in new directions. By the third year, you will have mastered many skills and be ready to take on new roles and mentor others. As you map out and travel on this journey, you will receive support and mentorship from others on your team, and from the labour relations officer (LRO) assigned to your worksite. LROs bring a wealth of experience with grievances and any issues that are proving hard to resolve, so stewards know they can seek support in the work they take on. There is no one type of person who makes the perfect BCNU steward. Every steward contributes their own experience and skills, and steward teams benefit from this diversity. Some of our most effective stewards are quiet people, with strong listening skills or creative minds. They are very powerful in grievance meetings. Others are very social – they are great at networking, and keeping their finger on the pulse of the worksite. What is required of those who step up to the steward role is a strong desire to grow and learn, to be a role model and leader at the worksite and to advocate for yourself, your colleagues and for safe patient care. Interested? Learn more at Steward Elections 2019. Already a steward? Access these tools to help you in your job.